Abstract: The use of dielectrophoresis and electroosmotic is fast becoming proven techniques for manipulating particles in microfluidic systems. Several approaches were experimented to improve the moving particles in the fluid and thus the force. This work will study the effect of active microelectrode on the moving particles of latex beads using a particle image velocimetry (PIV). PIV is the developed software to test the velocity of particles movement at varying frequencies of 10k to 500kHz with fixed voltage at 2Vpp.Summary: The progress and development in the technology gave birth and growth to MEMS (Micro-Electro-Mechanical System), which allowed the fabrication of the systems. One of the fields that had attracted attention was the fluid motion under the unexplored and unusual conditions which later known as the Microfluidic. The beauty of this field is it’s ability to integrate in other science and research field such as medical, chemical, environment, and electrical. References: Baker, D.R. (1984), Capillary Electrophoresis, Wiley, New York, X.
Clague, D. S. and E. K. Wheeler (2001). "Dielectrophoretic manipulation of macromolecules: The electric field." Physical Review E 64(2): 026605. El-Gholabzouri, O., et al. (2006). "Zeta-potential of polystyrene latex determined using different electrokinetic techniques in binary liquid mixtures." Colloids and Surfaces A: Physicochemical and Engineering Aspects 291(1–3): 30-37. Kitahara, A. , Watanabe, A. (1984), Electrical Phenomena at Interfaces, Marcel Dekker, New York. Jones, T. B. (1995). Electromechanics of Particles . New York : Cambridge University Press. M.P. Hughes, H. Morgan, M.F. Flynn, (1999) J. Colloid Interface Sci. 220, 454–457. Morgan, H. and N. G. Green (2003). 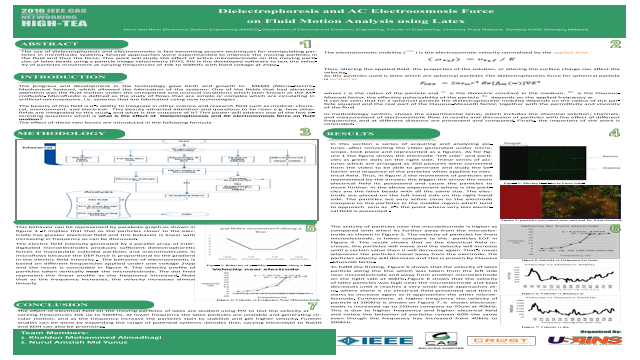 AC Electrokinetics: Colloids and Nanoparticles, Research Studies Press. N.G. Green, H. Morgan, J. Phys. Chem. 103 (1999) 41.